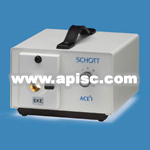 The ACER is a cost effective and reliable 150 Watt cold light source which provides premium quality, intense light for Stereo Microscopy, Macroscopy and Machine Vision applications. The modular concept of the ModulampR assembly allows flexible adaptation depending on the users requirements. The ACER Light Source will fully illuminate active bundle diameters up to 16 mm (.63"). The ACER Remote Light Source has all of the features of the premium quality ACER Light Source with the added convenience of the remote control. The DCRRIII is a DC-regulated 150 watt-halogen light source which provides intense, cold illumination for Machine Vision applications. Electronic current limiting protects the unit from overheating due to defective and aging lamps. A lamp change indicator at the front panel of the unit alerts the user of impending lamp failure due to an open or partly shorted filament. Transient protection allows for remote location of the lamp, which enables the use of the DCRRIII Remote Light Source Kit. 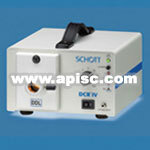 The electronically stabilized internal switching power supply accepts universal input voltage from 90 - 265 VAC. The DCRR III Light Source will fully illuminate active bundle diameters up to 16 mm (.63"). The DCRR III Plus Light Source includes all the standard features of the DCRR III with added benefit of a built-in RS232 interface providing intense, cool illumination via remote control. Remote controllable using built-in RS232 interface. Designed to control up to three additional DCRRIII units via a built-in 15-pin connector. (Expansion cable sold separately). Automatically restores user settings on power up. Enhanced communication available by embedding error checking codes in commands strings. Easier programmability with simplified command structure. The DCRR IV Light Source features an integrated Equalizer light feedback to provide stabilized light output for the most demanding machine vision inspection applications. Stable lamp output over the life of the lamp and minimized lamp to lamp variation. Used with a Reference ModulampR unit and off-the-shelf fiber optics maintains DDL lamp output at ±2% over the life of the lamp and ±8% lamp to lamp. For even greater control, use the DCRR IV with fiber optic products that have an integrated reference bundle. 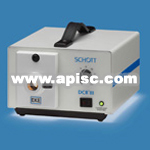 This will maintain DDL lamp output and lamp to lamp variation within ±1%. The MHRR-50 Light Source is a compact and powerful Metal Halide cold light source for applications which require highly intense, white light such as Machine Vision and Microscopy . The 50-watt Metal Halide lamp combines longevity (3500 h), excellent focusing efficiency and extremely high uniformity of the light spot. 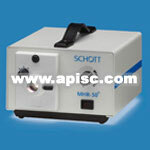 The MHRR-50 Light Source will fully illuminate active bundle diameters up to 12.7 mm (.5").